A few weeks back my parents went to my Cousin M’s wedding in California (still bummed I was unable to go). My father was in his glory because he is a HUGE LA Dodger fan. After they arrived home the boys and I went to visit. 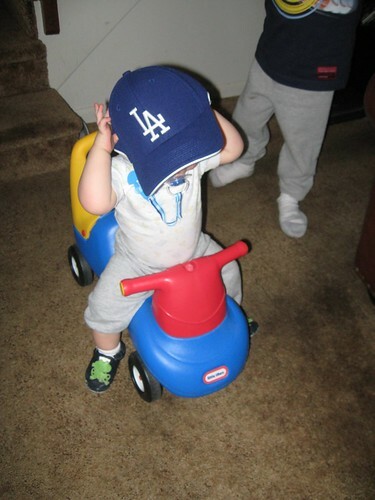 Dad quickly showed JSL his new LA Dodger hat and placed it on his head. 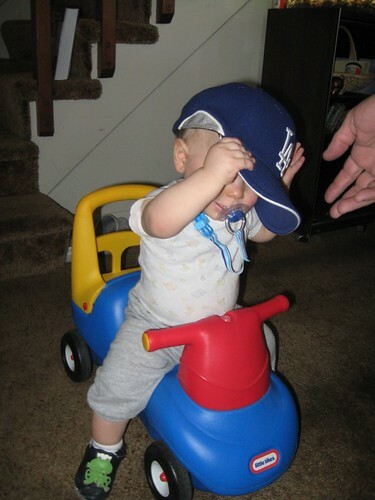 Here are some photos from JSL trying to fill Papa’s large hat. BTW – No Dad, I am not saying you have a big head. Mayor Big Head is the one with an extra large cranium! Be sure to hover over the photos for the captions. 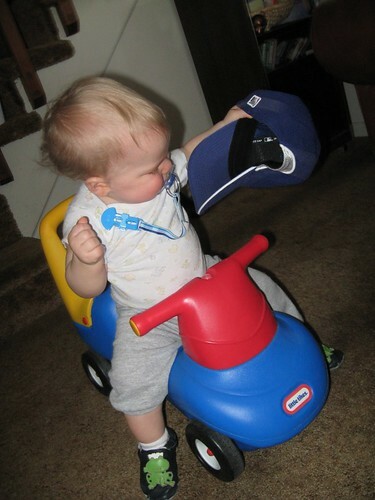 As you can see, JSL enjoyed playing with the hat more than actually wearing it. Hopefully he will appreciate the wearing more as the warm weather will require on in the days to come. On Monday when we went to take the boys outside to play a package was on our doorstep. I immediately noticed it was not an ordinary box (in a good way). 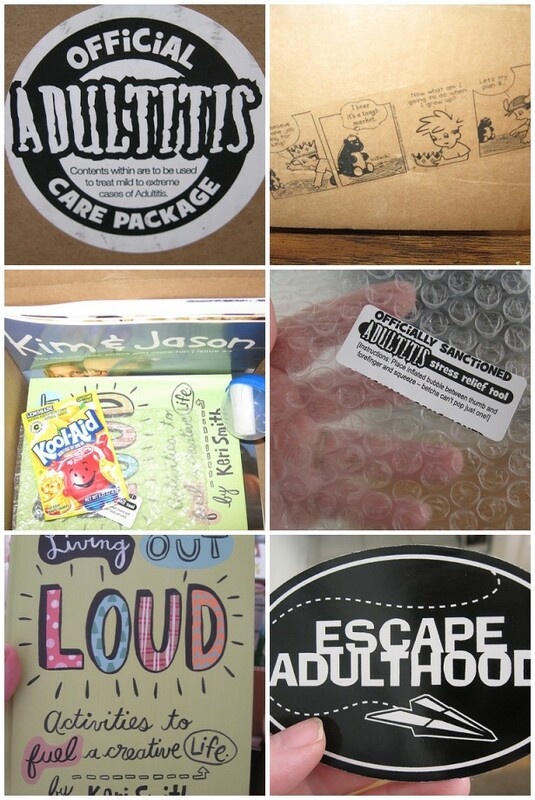 This box was covered in lots of fun stickers and things to make me even more excited about the contents from Kim & Jason of Lemonade Stand and Escape Adulthood. When I went inside I was blown away with how it was packaged. Here is a collage of the photos of the box and the goodies waiting for me inside. BTW – in case you were wondering what it was that was inside the box it was the book Living Out Loud – Activities to fuel a creative life by Keri Smith. It really looks like a fun read – I can not wait to get a good look at it. Thanks again to Kim and Jason for all of the surprises inside and out of the box! « Turtles, Dinos & Bears. . . oh my! I’m glad you enjoyed the extra goodies! We love to add those little surprises. Enjoy the book… a great pick!